Copper Aztec Hoe Money. Pre-columbian Mexico. 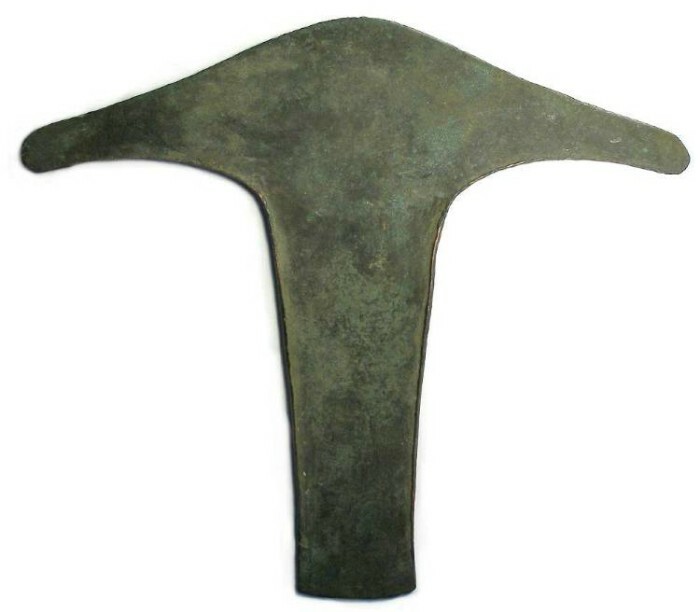 A variety of hoe or axe shaped objects were used as money by the Pre-columbian Indians of Mexico and Peru, possibly as early as the the 12th or 13th century AD. At least one type was still being used in the mid-16th century when, in 1548, a Spanish Conquestador wrote about them, describing their use as money, and gave an exchange rate against the Spanish real. That document exists in an archive in Toledo (Spain) but unfortunatly does not provide enough detail to identify the exact type he saw in use. This particular example is a type is generally found inthe Oaxaca province of Mexico and probably dates to the 14th to 15th century. Size : 132 mm long x 151 mm wide x 0.4 mm thick (on the main body) and about 3 mm thick on the raised rims that are on the underside of the blade, and along the edges of the handle part. Material : copper toned dark green, with lighter green deposits. Reference : Odd & Curious Money, 2nd edition, by Charles J. Opitz, page # center (he does not have a numbering system). In recent years these larger Aztec Hoe money has become difficult to find, but we recently purchases a old collection of them with several types, which we will be adding in the near future.